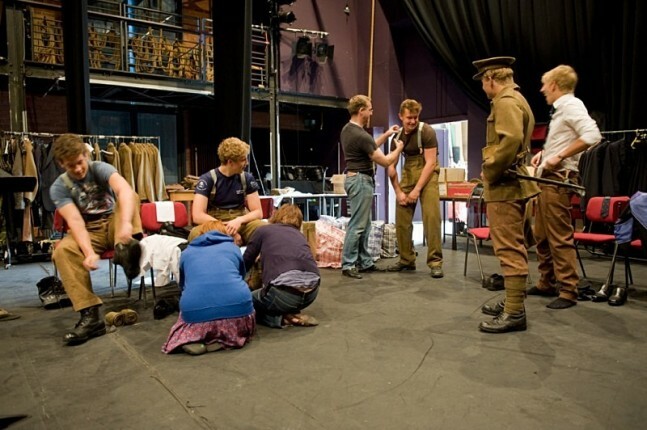 Capriol Films’ latest project, a feature film about Benjamin Britten, to be released as part of the celebrations that will be occurring throughout 2013, the centenary of the composer’s birth. Benjamin Britten is the most performed British composer worldwide and his music becomes more popular year by year. Even his critics accept that he produced a body of work that puts him on a level with Purcell and the legacy of his many recordings is a testimony to a pianist and conductor with truly extraordinary gifts. The Benjamin Britten website www.benjaminbrittenfilm.co.uk is now the centre of a community who are interested in this unique feature film project. It will be updated frequently, with news of casting, international sales and new research discoveries. This drama documentary for cinema explores the pacifism that was such a powerful influence on composer Benjamin Britten’s life and work. The story begins in 1929 at Gresham’s School in Norfolk, England. 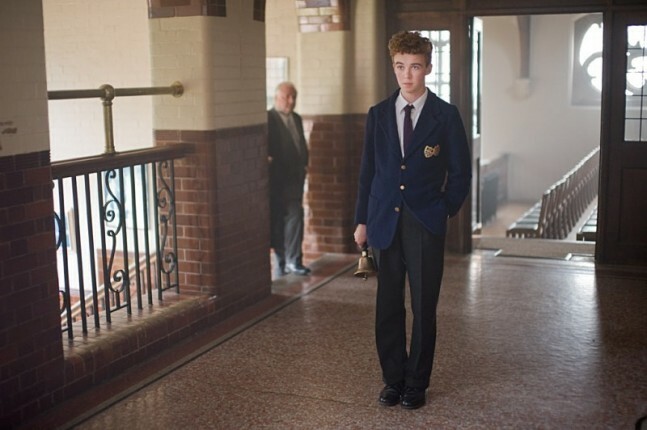 The brilliant seventeen year old Alex Lawther, playing the schoolboy Ben Britten and a group of fine young professional actors take us into a world which still resonates with the horrors of the First World War, where pupils are encouraged to address social and political issues and Benjamin Britten’s hatred of all things militaristic is forged. Gresham’s inspirational head of history, Simon Kinder explains that many of the boys in 1929 became communists, in part as a reaction to the threat of fascism. We see the young Donald Maclean, later to attain notoriety as one of the Cambridge spies, reading aloud from his strongly left wing short story. Britten must have known Maclean, but his name doesn’t appear in his diaries, whilst those of Oliver Berthoud, Peter Floud and David Layton do, frequently and we depict those friendships throughout the film. We see Ben’s sadness at the departure to Oxford University of Oliver Berthoud, who had played chamber music with him, we witness the pleasure Ben took in the company of the scholarly Peter Floud and we join cricket practice with Ben and David Layton, where Ben watches the Officers Training Corps at drill and proclaims that he hates the marching, the uniforms and all that it stands for. As we explore the music that illustrates Ben’s growing pacifism, illustrated by performances and unique observations from experts and friends, we frequently return to these dramatic interludes at Gresham’s, which cement the narrative – spoken by legendary actor John Hurt. Its clear that Ben has already decided that he will become a professional composer and that school and Music College are in a way obstacles to be got past in order to achieve that ambition. After leaving the Royal College of Music in 1933, Ben embarks upon his career, rapidly attaining success – initially working with Christopher Isherwood and W.H. Auden writing music for the left wing Group Theatre. His flirtation with communism is further extended by writing the ‘Russian Funeral’, for the communist composer Alan Bush – performed in the film by the Gresham’s School brass group. He also composes incidental music and songs for communist playwright Montagu Slater – performed for the first time since 1936 by the Gresham’s senior choir with soloist James Gilchrist. With the first movement of the Sinfonia da Requiem as background, we follow Ben’s journey to America with his life partner, Peter Pears in 1939 and their return to England in 1942, where both are granted non combatant status and Ben begins work on his groundbreaking opera ‘Peter Grimes’. We flashback to more scenes of young Ben, imagining the fate of the bright faced young cadets of the officer training corps and illustrated by First World War collages from artist Patience Foster. The contemporary performances of ‘Oh My Blacke Soule’ from the Holy Sonnets of John Donne by tenor James Gilchrist and pianist Iain Burnside and the first movement of the second string quartet by the Benyounes Quartet illustrate Ben’s anguish at having witnessed the horrors of Belsen, where he accompanied violinist Yehudi Menuhin in 1945 and which profoundly influenced his adoption of a ‘pure’ pacifism. The flirtation with communism is finished, but the quest for peace remains with him until the end of his life. One of the last survivors of the Auschwitz women’s orchestra, Anita Lasker Wallfisch tells us about being a member of the audience at Belsen, when Ben and Menuhin performed and only long after realising that the extraordinary young pianist she had so admired was Benjamin Britten, who she worked for as a cellist in his ‘house band’ the English Chamber Orchestra. She also recounts a hilarious and drunken lunch party the ECO cello section gave for Rostropovich and Ben and Peter Pears’ agent for many years, Sue Phipps, tells us how ‘Slava’ as he was universally known brought a new lease of life to the by now establishment composer from the early sixties. But although as he said; ‘one tends to become more conservative as one gets older’, Ben remains committed to membership of many peace organisations including the Peace Pledge Union, CND and the now defunct Fellowship Party. International ‘cellist Raphael Wallfisch explains how the relationship with Slava created much of the finest of Ben’s later work, including the First ‘Cello suite, two movements of which Raphael performs, whilst tracing their genesis back to the pacifist composer Frank Bridge – Ben’s first and most influential composition teacher. The transcendent music of the end of the War Requiem accompanies the climax of the film, commencing with interior and exterior shots at Ors, Northern France of La Maison Forèstiere, the uniquely atmospheric installation created by conceptual artist Simon Patterson from the shell of the house where poet Wilfred Owen spent his last night before being killed – days before the end of the First World War. Nine of Owens’s poems feature in War Requiem and from La Maison we go to the poet’s grave in Ors and then on to the war cemetery at Tyne Cot, near Passchendale , where we linger amongst the twelve thousand graves and thirty five thousand names of the dead of Flanders. As a postscript, John Hurt speaks to camera about Ben’s supposed cruelty to people in his orbit and he and Sue Phipps come to the conclusion that for this supremely gifted composer the music always had to come first – music that resonates now more than ever. As testament to this affirmation, the Gresham’s School senior choir perform the haunting ‘Hymn to the Virgin’ written by Ben in 1939 during one of his many spells in the school sanatorium. As their fresh young voices soar, we once more remember Ben at school – an ordinary boy whose extraordinary gifts are being celebrated throughout the world in this centenary year of his birth.